This has taken awhile to filter into the Western press, but an asteroid exploded over the town of Bone,Indonesia on October 8th at around 11am local time. 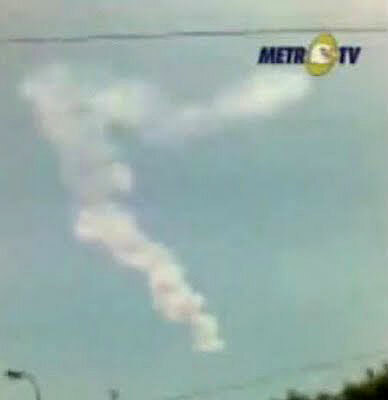 The dusty tail as a result of an asteroid explosion over Bone, Indonesia on October 8th. Initially, locals called the police to report that a plane had crashed, or that an earthquake shook the ground, as reported in the Jakarta Globe. The Jakarta Post quoted Thomas Djamaluddin, head of the Lapan Center for Climate and Atmosphere Science Implementation as saying that the explosion was due to a meteorite or bit of space junk that had entered the Earth’s atmosphere. As it turns out after further analysis, the explosion was due to an asteroid about 5-10 meters (15-30 feet) in diameter exploding in the air between 15 and 20 km (nine to 12 miles) above sea level. Nobody was injured as a result of the explosion, but it evidently caused quite a scare with the local population!